Warren L. Strickland III, M.D. Kelley Smith, M. D. graduated from Meharry Medical College in Nashville Tennessee in 1991. He then entered the United States Army and completed his Internal Medicine Residency at William Beaumont Army Medical Center in El Paso Texas. He then served two years as a staff Internist at Winn Army Community Hospital in Fort Stewart Georgia. During this time, he also served overseas in Kuwait. He then completed his Cardiology fellowship at Brooke Army Medical Center in San Antonia Texas in 1999. During the next three years on active duty, he was a staff Cardiologist at Eisenhower Army Medical Center in Augusta Georgia. He then left the military and came to Huntsville to establish private practice at HCC. This practice offered him the opportunity to practice cardiology in a move traditional model in continuity and care for his patients. He practices at both Crestwood and Huntsville Hospital. He has been Medical Director of Cardiology at Crestwood Hospital since 2012. 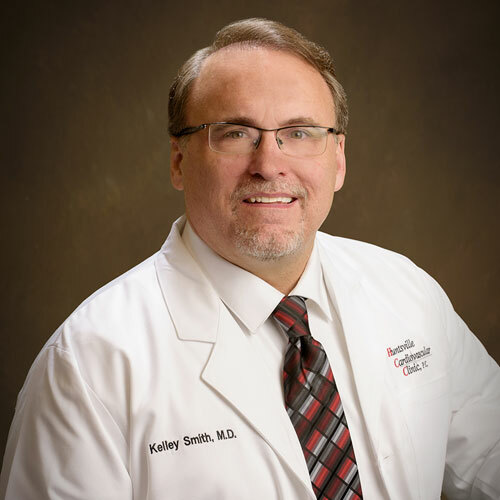 Dr. Smith is Board Certified in Cardiovascular Disease, Interventional Cardiology and Nuclear Cardiology. He has an interest in all aspects of clinical cardiology as well as percutaneous coronary intervention and permanent pacemaker implantation. He also has an interest in diagnosis and treatment of Venous disease to include radiofrequency ablation. Dr. Smith grew up in Columbia Tennessee. He and his wife have five children and have been living in Huntsville Alabama since 2002.